With support from an ISU Graduate Research Fellow, History doctoral candidate Michael Belding is spending this semester conducting research at the Gotha Research Center in Gotha, Germany. There, he will focus on a collection of letters written by immigrants in the Midwest to family and friends in Germany. These letters provide evidence for his dissertation, an examination of the construction of nationality in the nineteenth-century Midwest. Belding argues that agroenvironmental practices and ideas were a vital part of American political culture. 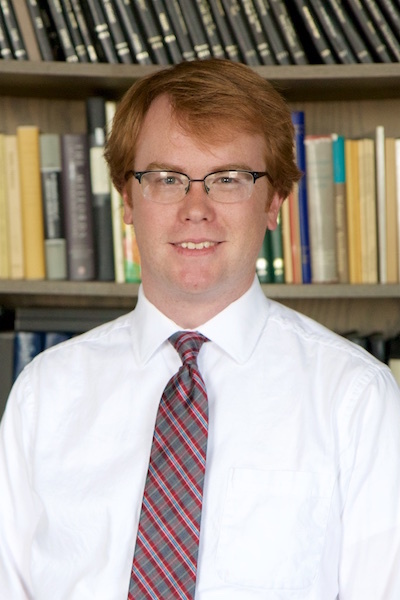 His dissertation rests on reports of state- and county-level agricultural societies, the publications they frequently cooperated with, and the correspondence of their leaders. However, in order to address the question of what farmers were actually doing with the advice they were given and how they saw themselves in a wide-ranging political economy, he is consulting the letters of immigrants to the United States. These missives frequently described and evaluated the land and landscape for relatives and friends in Europe and also commented on larger political themes, such as the Civil War. Belding considers his work to be a history of the free labor economy that was being created in the nineteenth century to compete with a slave labor economy, which led to the Civil War and the rewriting of the meaning of American citizenship.